Satire lives. 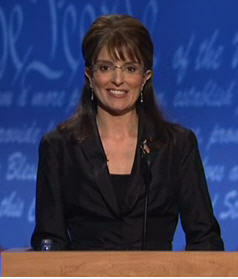 I thought that everyone had been enjoying Tina Fey’s totally brilliant impersonation of Sarah Palin on Saturday Night Live for the past few weeks. But several people I know haven’t seen it and more than that, the Governor of Alaska’s genuine appearance on SNL last night has just been reported on Radio 4 news. So it’s worth a post. Queen Latifah is such a star. y’know…Da y’all think we c’d git Gordon and Davy to get mavericky and give us s’m REAL politicks? I’m not gonna answer that question, I’m gonna answer a totally different question.